Bianca Tang Archives - Moran Eye Associates, P.C. Have some safe summer fun in the sun! Dr. Moran makes sure that every member of his team is well-taken care of! To help insure a safe & happy 4th of July holiday, he gave us a special Independence Day gift…wide-brimmed hats to keep the sun off of our faces and out of our eyes! When we hit the beach and the pool, we’ll be sure to complete the look by adding sunscreen and sunglasses with UV Protection to keep our skin and eyes safe from the damaging rays of the sun! Dr. M always takes the time to show that he cares for his patients and his staff too! So we weren’t surprised that he took an extra step to make sure that we will return from the holiday well-rested. The hats have a special “Do Not Disturb” message on the brim! Please note! Our office will be closed Wednesday, July 4th and Thursday, 5th of July. We will re-open on Monday, July 9th. 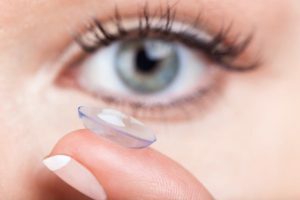 Contact lenses are a medical device, so the first step in becoming a contact lens wearer is a complete eye exam. For most prescriptions, we have trial lenses that you can try on at your appointment. The doctor will place the lens on your eye, and check the fit through the slit lamp as you blink and move your eyes. It is important that the lens fit is just right. Your contact lens should sit comfortably on the eye an be able to move when you blink so that oxygen can reach your eye. Your contact lens prescription will indicate a lens power, base curve and diameter. These numbers will be printed on the side of your contact lens box. If your eyes have different prescriptions, it’s important that you put the right lens on the right eye…and the left lens on the left eye! Inserting contact lenses for the first time can be challenging. Dr. Tang will sit with you and guide you through the process in our office. We have a variety of tips and techniques that make inserting lenses easy. Don’t worry, we make sure you can comfortably put your contacts IN and take them OUT safely before you go home! Be patient…practice makes perfect. The most important thing is that we recommend no sleeping in your contact lenses. Extended wear (sleeping in contacts) vs. daily wear and cleaning, has been shown to increase the risk of eye infections by 5-7 times. Eye infections can lead to serious complications including permanent vision loss. See if contacts are right for you… Schedule an appointment! Moran Eye Associates is expanding our services to bring technology to patients with low vision. Moran Eye Associates new doctor, Bianca Tang, O.D., is now scheduling Low Vision Evaluations. She offers patients solutions to make the most of the vision that they have. People with low vision have difficulty seeing even if they are wearing glasses. These patients may have only partial sight, such as blurred vision, blind spots or tunnel vision. The cause of these vision loss issues may be macular degeneration, diabetic retinopathy or glaucoma. Although low vision can impact people of all ages, it is primarily associated with older adults. With the right technology, we can help patients regain the ability to enjoy improved sight both near and far. Distance Vision: Watching TV, Movies, Shopping, Viewing Sporting Events and Plays. Our goal is to help patients live more independently by making everyday tasks easier. Dr. Tang will help patients develop strategies that lead to a more independent and active lifestyle. By pairing patients with the right low-vision aids, she can maximize their remaining sight. These devices enhance contrast, control glare, and magnify objects. Some of these vision aids are lightweight and portable, so you can once again enjoy reading a menu, watching a ball game or working on projects around the house. Make the most of your vision! Schedule your evaluation appointment today. Financial assistance is available for patients who qualify. To schedule your Low Vision Evaluation, call or text 610-628-2022, or click for an appointment request.